Saracens Head Inn01600 890435work Restaurant - PubThe Saracens Head is a great place to eat & drink in the beautiful surroundings of the Wye Valley all served in a relaxed, friendly environment. Set on the banks of the River Wye where it flows through the gorge of Symonds Yat, we have a great location for you to relax and enjoy stunning food. We serve a wide variety of dishes at Saracens Head Inn that change from season-to-season from our Lunch Menu, Dinner Menu and daily specials board. Sandwiches and filled organic baguettes are also served during lunchtimes. The chefs at Saracens Head Inn use fresh ingredients which are locally-sourced whenever possible. Meals can be enjoyed in our informal dining room, the lounge area, the bar or on the riverside terraces. 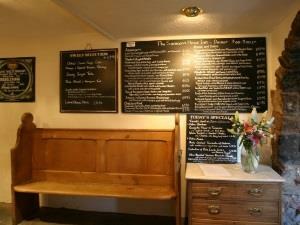 The flagstone-floored bar, with its scrubbed pine tables, has retained the feel of an authenic old English Inn. The bar is open all day everyday and offers a fine selection of classic and local real ales, ciders and quality wines, by the glass or bottle. The riverside terraces are the ideal place to watch the Inn’s ancient hand ferry carry passengers across the Wye as it did in yesteryear.